Are you looking for Tutors in Dumfries and South West Scotland? The Dumfries office of Clever Tutors is a professional provider of private one to one home tutors in a range of school based and professional study subjects covering all urban and rural areas within the location of South West Scotland. We have tutors in South West Scotland that cover a range of subjects including maths, English, science and entrance exam tuition. Areas covered include: Annan, Castle Douglas, Dumfries, Lockerbie, Stranraer and many more. The Dumfries office is run by Dr Alan Watson a professional educationalist who holds both a BA (Hons) degree and a PhD in education. Dr Watson has a passion for, and a professional approach to learning, and strives to ensure that all students achieve their very best whatever their ability. In addition we offer Life Coaching which is an effective way of assisting people to grow and develop, so they achieve their goals in life. We are dedicated to serving the needs of all students regardless of their background. We offer tuition at most levels, ranging from primary, secondary, post 16 and undergraduate/degree levels of study. Our tutors in Dumfries and South West Scotland, specialise in a wide range of disciplines from the core subjects of maths, English, science, languages, to sociology, history and degree preparation of sub-disciplines. In addition, we offer tuition in a variety of musical instruments in Dumfries, from beginners level to mastery, including exam preparation. … both of these can be provided with the first lesson starting at just £20. We can also provide STUDY COACHING. Learn smarter, not harder. Study coaching allows you to gain an understanding of the most effective ways to learn. How to develop a high impact learning/study plan, time management and empowering strategies to navigate your learning journey to higher grades. If you are a school or college we can also provide targeted intervention for individual pupils or in small groups. Find out more here. In addition to providing high quality 1-1 tuition at home, Clever Tutors can also provide services direct to schools and colleges. Clever Tutors supplementary and alternative educational programme for schools and colleges offer a student centred 1-1 and/or small group provision (maximum of 5 students), focused on embedding a culture of high expectations emphasising personalised academic and developmental progression offered right across the curriculum. With one call, we can provide you with high quality one-to-one bespoke education programmes, and small group tuition for underachieving and/or challenging children and young people. We operate a specialised service for the provision of supplementary (after school and during school hours), for pupils and students of all ages: for younger children, for students and for adults. Our tutors are very knowledgeable about the subjects they teach, all school and college subjects are covered as well as many university subjects. Subjects include: mathematics tuition, English tuition, sciences, languages and the humanities. We tutor in all levels. We support pupils preparing for exams, including SAT, the 11 plus Common Entrance and other entrance exams. We provide a tutoring service for all schools and colleges both state and Independent (including tutoring given for looked-after-children and for special needs support). We can also provide tutors to families who have decided to home educate their children. Dr Alan Watson BA (Hons), Dip SW, PG Dip SW, MA PhD. We are here to help 24 hours per day, 7 days per week. 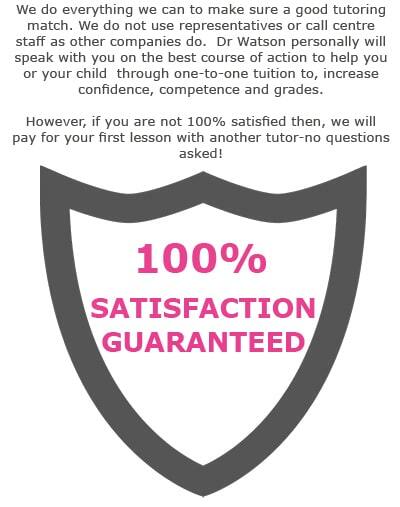 Private tuition on a one to one basis is a highly effective way of increasing confidence, competence and grades. We will discuss with you your individual requirements, including any relevant background information, and your academic goals before selecting the most appropriate tutor in the Cumbria area for your circumstances. All our tutors are experienced, highly qualified, hold enhanced DBS clearance and have been vetted by us. Moreover, our Cumbria tutors are committed to the Clever Tutors Child Protection Policy and are fully insured for your peace of mind. We believe at Clever Tutors that transparency of fees is important for prospective students and their families. We do not charge registration fees, finding fees, or administration fees. All the work we do upfront in finding the perfect tutor is completely free of charge, and comes with no strings attached. You will only pay if you go ahead with one of our tutors, and everything is rolled into the prices, quoted below. This ‘no hidden fees policy’ makes us pretty unique among providers of educational home tuition. We just love simplicity and transparency. Contact us now to book one of our tutors 01900 608211. We can guarantee that our rates are fair and competitive and we continually review our rates of tuition to ensure a more affordable and suitable tuition for everyone. Our prices start from £25.00 per hour when ten lessons are booked and are one hour tuition which is incredibly affordable pricing for quality professional tuition. This is exceptionally good value given the areas we serve and who we look to serve. It is advised that you discuss pricing with us during your free initial consultation. You can also set a budget during this consultation and we will try our best to meet your expectations and tutoring needs. After all, we are here to help and not to break your bank. Key Stage 1 and 2 tuition is available for £250.00 for ten lessons. It’s true, we really do want you and your child to have the highest quality of tuition. We do not ask for any up front payments or registration fees. There are no contracts to sign, or any requirements for a minimum number of lessons. We offer short term intensive tuition as well as ongoing support , which can continue for many weeks and months. The rhythm and routine for lessons can, and will, evolve to bring the best benefit to the student. With experience of tutoring children and adults on a one-to-one basis, we know that children and adults make remarkable progress in only a few weeks, Ability, self belief, competence, confidence, enjoyment, all begin to take root and grow. We are here to help, because we are committed to providing productive high quality tuition. Affordable, from as little as £25 per week. “John is great Archie has really taken to him already thank you so much for sending him to us. I have been telling everyone about your company. Thank you again.” L.H. This is to certify that Cumbria Clever Tutors has given valuable support to the HOUSEHOLD CAVALRY and is recorded as a friend of the Regiment. SIGNED Regimental Adjutant Household Cavalry. Feel free to contact us to discuss your individual requirements. If you have a request for a subject not listed in the above, then please contact us, as we can often use our contacts to recruit a specific tutor just for you. To find out more, or to get in touch with us directly, simply call us on 01900 608211 or fill in the form below and one of our representatives will be in touch with you shortly. We look forward to hearing from you. If you are a tutor looking for tutor jobs in South West Scotland, please apply here. After having our most successful year to date in supplementary education, Clever Tutors are implementing World leading technology in the form of Bramble. This delivers the impossible with better access to tutors, creating better revision materials, and automated reporting from the best in class software, thus offering the student more flexibility and reach in directing the power of technology and the internet towards online tutoring. Bramble fuses the audio and visual elements of the best-in-class software like Skillcast, Skype, Loop and Facetime with a big interactive Whiteboard that allows real-time on screen editing, annotation and a copy/paste /upload/import function for total immersion and connectivity between tutor and student. There are no delays, tutors and students see and hear each others actions as they happen. This enhances cognitive learning, problem solving and retention and recollection of knowledge. Bramble also offers greater flexibility on the time and location of tutoring whether it is in the home, online or both. We are committed to providing dependable, flexible, imaginative expert tutors who understand education. In enabling change, not just delivering a lesson which is cost effective, great value for money can be obtained with a commitment to each and every student and the best possible online tutoring experience.